Come to the River House for a prestige holiday experience. Breathtaking panoramic views and luxurious accomodation place this beautiful home in a class of its own. For those discerning holiday makers who choose to be surrounded by an elegant contemporary style whilst being seduced by the gentle breezes of natures paradise, the River House is for you. Just relax on the expansive decks over looking the river with a cold plate of the local Nambucca River oysters, or sip a glass of champagne and watch the sunsets surrounded by a haven of tropical palms. The River House offers a unique standard of excellence which is unsurpassed in the region. The house consists of 4 bedrooms (1 with Queen bed, 2 with double beds and 1 with 2 single beds), 2 bathrooms (1 is the ensuite to the master bedroom), a large fully appointed gourmet kitchen, and generous dining and lounge room areas. The outside deck has a large deluxe 4 burner BBQ and dining setting for 8. There are 2 log fires for those magical wintery nights. The River House is in a prime location, positioned where the river meets the sea. The tropical back garden is gently landscaped all the way to the edge of "Deep Creek", which is famous in the area for swimming, fishing and boating. It is just 500m down stream from the mouth of the river that opens onto the golden sands of the Nambucca beach, a popular surfing spot. It is about a 5-minute drive from the sea side resort of the Nambucca Heads and about 30 minutes from Coffs Harbour and the airport with flights going to all the major cities. The River House is perfectly positioned to nearby resorts, golf links and great dining. The unique location of this prestigious home not only provides a host of great river activities, but also the option of a surf beach. All this, and the spectacular views that greet any guest who walks in with an overwhelming instant "Wow" factor, places the River House in a class of its own. Nambucca Heads is in a prime spot, ideally positioned to offer a wide range of attractions, both culturally and geographically. It is just a short drive from the township of Bellingen which is a hub for the local arts and craftspeople with a regular market, specialising in arts and crafts, organic food, live music, and a colourful community. From the coast at Nambucca Heads through the beautiful valleys of Bellingen to the high mountains of the Dorrigo escarpment, one can take a day trip and experience all of these magical changes of scenery. The township of Nambucca Heads offers all the modern conveniences, cinema, supermarket, video store and medical facilities. With Coffs Harbour just 30 minutes away there is access to a great range of activities including whale watching, scuba diving, sky diving and go-cart racing!, just to name a few. The Nambucca River offers fantastic fishing and the golf course beside the river is tricky enough to test even the wiliest golfer. The weather is nothing short of spectacular all year round and of course who could refuse a delicious plate of the famous Nambucca River oysters? Seasonal attractions include the Bellingen Market held on the 3rd Saturday of every month in the beautiful town of Bellingen NSW it’s the place to indulge your senses and have a wonderful time. Come for the weekend or stay a week, there’s lots of good stuff to see, do and hear in Bellingen with live music, family fun together with produce and food stalls. The Volkswagon spectacular, held every two years in Nambucca around late July. Thousands of VW,s converge on the area for at least a week and is one of the largest volkswagon shows in Australia. Racing, show & shine, fun events, swap meet, Local Markets and much much more! The Hot Rods are back in the Nambucca Valley for their annual rally from in most incredible display of multi-coloured, polished and chromium embellished hotrods from all over Australia. When the "Drag-ens Hotrod Club" visits Valla Beach and Nambucca Heads, they do it in style with the most beautiful array of superb hotrods you've ever seen in your whole life! You'll see these fantastic machines all over the Nambucca Valley during the course of the school holidays. But things reach fever pitch on Saturday morning when hundreds of these wondrous machines slowly parade through Nambucca Heads in columns of four vehicles, finally coming to a halt in the main street at about 10.00 am. During the course of the next two hours you'll be welcome to inspect this cornucopia of motor vehicle excellence, talk to the vehicle owners, look under the hoods, take photographs and generally drool to your heart's content. And it's all totally free! Local businesses and Service Clubs take the opportunity to set up stalls along the footpaths, creating a real carnival atmosphere in the process. You'll definitely have a ball. The FIA World Rally Championship (“WRC”) is one of the World’s most diverse, exciting and gruelling motorsports. It is energetic, exciting, uncompromising and action-packed. It requires skill, courage, passion, endurance and the ability to adapt to changing conditions. The beautiful Coffs Coast in Northern NSW during September shall play host to Coates Hire Rally Australia: the Australasian leg of the WRC. The Coates Hire Rally Australia is also a Round of the brilliant East Coast Bullbars Australian Rally Championship. Check the website for rally dates: . Take a helicopter ride over the coffs coast or into the hinterland over Dorrigo. You will see celebrity homes such as Russell Crowe, George Negus and Jack Thompson or get a birds eye seat of the rally by air but book in early. Discover Sawtel. a vibrant seaside town with beautiful beaches and magnificent eateries. For the best prawn rolls on the coast try the sea salt fish and chip shop in the main st of Sawtel. Terrific house in beautiful location. Only a short stay but will be back for a longer visit. Very peaceful and relaxing couple of days. So hard to leave this beautiful home. Was very peaceful, and the view from the back deck was awesome. House is large and would be perfect for families. A short drive to Nambucca and the local shops. Would definately love to stay again. Had a great weekend, loved the position & the amount of space we had in the house . Thanks Lee glad you enjoyed it. It is hard not to it is a pretty nice spot. Perfect location! Great spot for families. Another great stay! This is a wonderful spot for all the family. Plenty of space, very comfortable with all amenities. Proximity to the river is a bonus - we all enjoyed chasing hermit crabs and watching the birdlife. Thank you, Stephen, for sorting out the access code - that was the only downside and may have been me not knowing how the app worked! 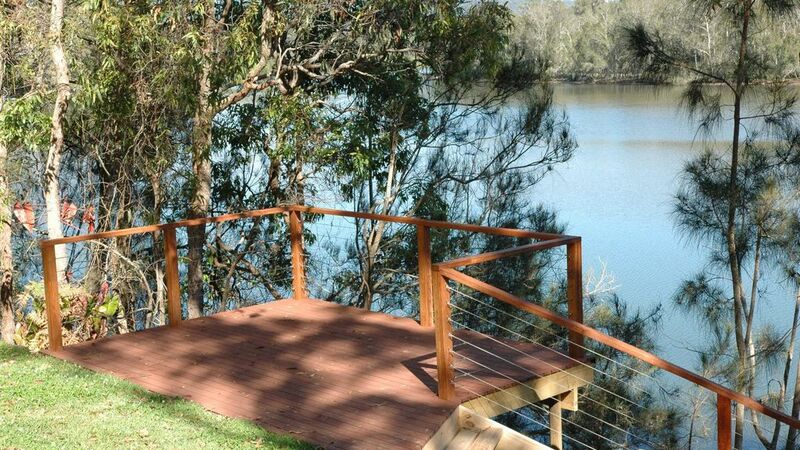 Beautiful location, Great property with lots of bird life and kangaroos by the river. Kids loved that the property backed on to the river. Owner was helpful and we have already recommended this place to friends and family!